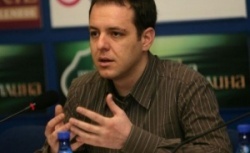 Interview of Novinite.com and Novinite.bg with Borislav Sandov, co-chairman of the Greens party “Zelenite”, on the upcoming general elections in Bulgaria on May 12. Borislav Sandov is 29 years old and lives in Sofia. He started his education in his hometown Madan and continued it in the professional tourism high-school in the town of Smolyan. Sandov completed a Bachelor's degree in Geography and a Master's degree in Management of water and climate resources in Sofia University “St. Kliment Ohridski”. In 2006, during his mandate as vice-chairman of the Student Committee, alongside other colleagues from “St. Kliment Ohridski” university, Sandov established the University Club for Ecology and Sustainable Development “UNECO”. He engages in politics, various projects and activism in climate, energetics, farming and foods. Sandov is among the main organizers of the massive protests during the last years against genetically-modified organisms, shell gas, forests' cut-down and the traditional, since 2009, civil protest on January 14. He also participates in international campaigns. Sandov is a coordinator of the Bulgarian movement for food independence and climate justice. He participates in the committee of the Bulgarian Climate Coalition, the“Anna Politikovskaya” Association of Free Speech, GMO-free Bulgaria, Bulgaria without cyanide, Fracking-free Bulgaria, Bulgarian anti-nuclear citizens, BeleNO! and others. Sandov works in the Foundation for environment and farming. Currently Co-chairman of the Greens party “Zelenite”. Mr. Sandov, what do you think of the recent wiretapping scandal, implicating the former rulers – is it just mudslinging or something more? Unfortunately, it's a lot more. Way back in 2009 and 2010, we protested against this government's attempts to establish a “police state” by the electronic messages law. Subsequently, by ACTA and other ways, by which they would enter Bulgarians in a huge “Big Brother”, in an Orwellian script from 1986. The issue is, that they not only eavesdrop on everybody, including and mostly their inconvenient opponents. This transforms into a network, which reminds me of the former totalitarian services, like “DS” (State Service). This is the new “DS”. The latest revelations show that even after the resignation of the cabinet, rulers from GERB have carried on with the phone-tapping. What's more scandalous, is what has been revealed. The problem is too serious and I wouldn't say it is only pre-elections or discrediting. What should the state do, so that Bulgaria and its citizens benefit from the “expensive” green energy? The energy from renewable resources is free. It is everywhere around us, and what the country should do, is ease-up the administrative procedures, reduce bureaucracy. In populated places, there have to be solar and wind collectors, which produce energy, where it is being used. Another thing the country has to implement are the so-called “smart networks”, so that there is a reasonable transfer of energy, during the whole process of production and consumption, which doesn't cost us 30% from production to end-consumer like now. “Zelenite” have not participated in any parliament in Bulgaria so far. What are the main problems the country faces and how can they be solved? The problems are too many. Most of them come from the lack of real democracy in our country. We do not have real separation of authorities, which would allow a more democratic development. Citizens take part once every four years, during elections, in important decision-making. “Zelenite”, entering the parliament, will immediately improve those procedures, so that we open the door from inside-out. So that citizens have better transparency about what's happening in the parliament, so that there are possibilities for control and civil participation. Real, not just formal like now. We also must diversify energy resources, regarding where they come from. At the moment there is a monopoly on those from one state – Russia. This monopoly makes us dependent on other issues too and often we even end up being geopolitically blackmailed. We should re-route Bulgaria to developing tourism, farming, transport, trade, new technologies – that, which we can benefit from in the long term and face competition from the European and world markets. We can compete with high-quality products, for which there is brisk demand west, in the European Union, as well as east, in Turkey and the Middle East, which has become economically very strong and looking for quality products, especially from the EU. What do “Zelenite” offer economic-wise to better the average Bulgarian’s situation? We should cut down what we spend on products we don't need or can produce ourselves. We can preserve and protect our environmental and cultural heritage by developing it the right way. To develop bio-farming, alternative tourism, new energy resources. This will also create new jobs. When are we going to see a “green” party in the parliament? We expect “Zelenite” to enter this parliament. The 21st century is the century of the “greens” and it is only a question of time for this to happen. The Bulgarian society has matured for this step. The Bulgarians will understand, that other people, different from the existing parties, can represent the country. We can be a constructive player by means of new politics. Bulgaria is often criticized by the EU about the levels of corruption and opacity in the justice system... Bulgaria's court system is still monitored. We all have to work together to overcome this huge gap.